It has been awhile since I took a flex day. I decided at the 11th hour to take a day off and treated myself to a four day weekend. Was I going to do anything exciting? No. Was I going anywhere? Not so much. So why take the day off? Cause I can, I guess (I tend to work enough hours to cover the flex day, even if I’m not flexing). Honestly, I had no idea why I took the day off. It was a rainy day, I had nothing to do. Even so, it probably was a good thing to do, mental wise anyway. With an unexpected Friday off, what is a girl to do? Sleep in till 7:30am (that’s right, that’s me sleeping in! ), go run a route through Rockefeller Preserve I haven’t done in forever, but love, grab some coffee at a coffee shop I haven’t been to in forever (Coffee Labs), and then go home and hunker down for the day. Well not totally. I did some much needed cleaning and home maintenance (sinks don’t unclog themselves! 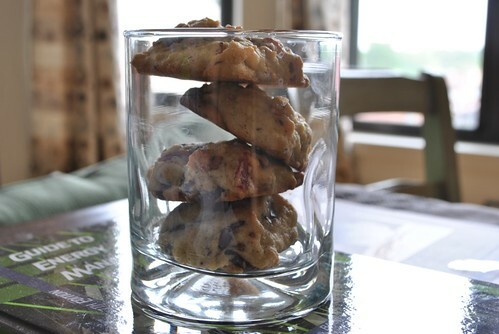 ), and made some cookies. 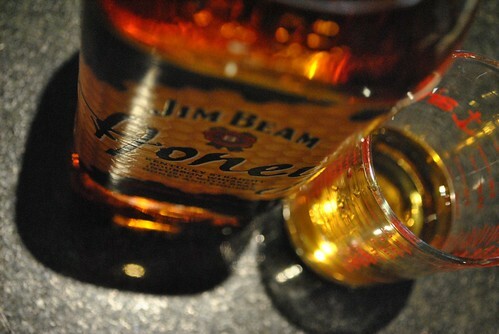 A friend of mine is currently in Kentucky touring the Bourbon trail. 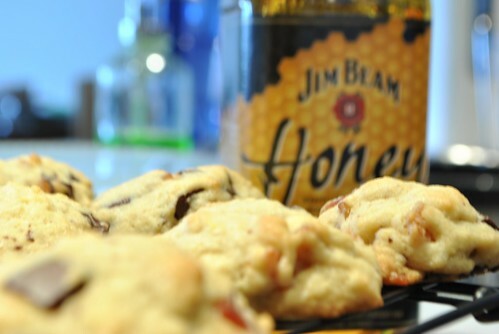 Inspired by her trip, I thought I’d make some cookies with Bourbon and maybe throw some bacon in. First crisp up the bacon in a large pan. Once the bacon is crisp, transfer to a paper towel to cool and pour the bacon oil from the pan into a bowl and let it cool in the fridge until it solidifies. Preheat the oven to 375 degF and line a couple of cookie sheets with parchment paper. Toss together the flour, baking powder, baking soda and salt in a medium bowl. 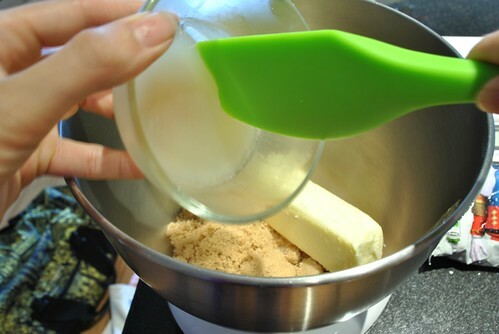 In the bowl of an electric mixer and with a paddle attachment, beat together the butter, bacon fat, sugars, bourbon and vanilla extract until smooth. Beat in the eggs one at a time, scrapping down the sides of the bowl as needed. Put in the flour mixture into the mixer bowl all at once and stir until just about combined. 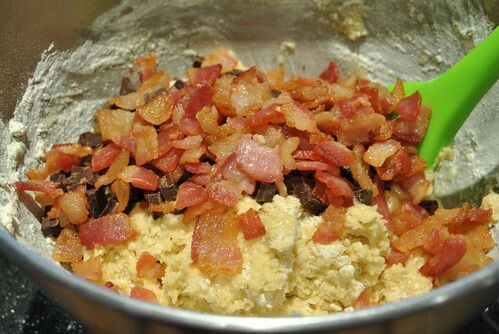 By hand, mix in the bacon and chocolate until well combined. 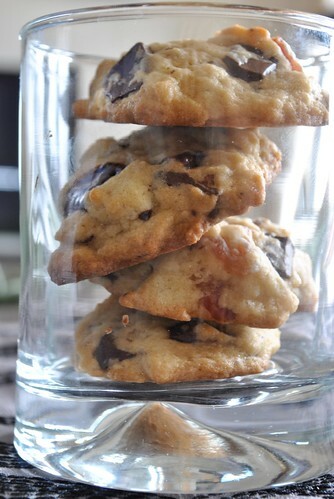 Scoop out equal rounded spoonfuls and place on the prepped sheets giving the cookies a few inches of room to spread. Into the oven for about 9 to 11 minutes, until the edges are just slightly golden brown. Let stand for a minute or two before transferring to a wire rack to cool all the way. The original recipe called for 3/4 pound bacon, and to reserve 1/2 cup of bacon fat. In my freezer I could only muster out 1/2 pound of bacon, and I just used all the fat I got when I cooked the bacon. While this amount of bacon was sufficient, going with the full 3/4 pound of bacon probably wouldn’t hurt either. If you like the sweet and salty combination (I sure do), then feel free to use a dark chocolate with a lower amount of cocoa. I only had 4 ounces of 60% cocoa and 1 ounce of a 100% cocoa on hand. Don’t use 100%, the bitterness does this cookie no favors. However the 60% worked out well, sweet, but not overly so. 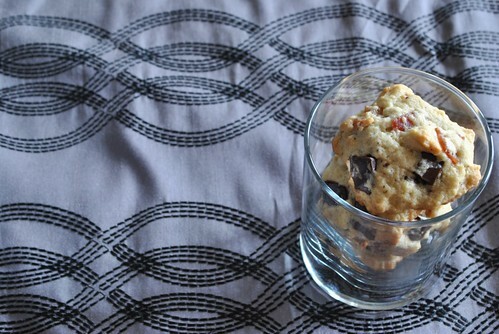 This is more of a bacon chocolate cookie than a bourbon cookie. But it’s all good. I still ate way too much to compensate for my 7 mile run this morning! This entry was posted in Cookies, Uncategorized and tagged bacon, Bourbon, cookies, Jim Beam Honey Bourbon. Bookmark the permalink.